Important Note: MSConfig can be used to configure several things other than just startup programs, so be careful what you do with it. If you’re not sure about using it, just follow the steps in this article and you should be fine. If you are using Windows XP, open the Run dialog box from the Start menu, type “msconfig.exe” in the Open edit box, and click OK. 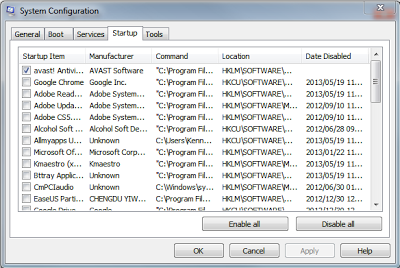 If you are using Vista or Windows 7 click the Start Orb in the menu search box type “msconfig” (without the quotes). As you type, results display. When you see “msconfig.exe,” click on it or press Enter, if it is highlighted. In XP, Vista and Windows 7 click the Startup tab on the System Configuration main window. A list of all the startup programs displays with a check box next to each one. To prevent a program from starting up with Windows, select the check box next to the desired program so there is NO check mark in the box. Click Apply once you have made your choices. 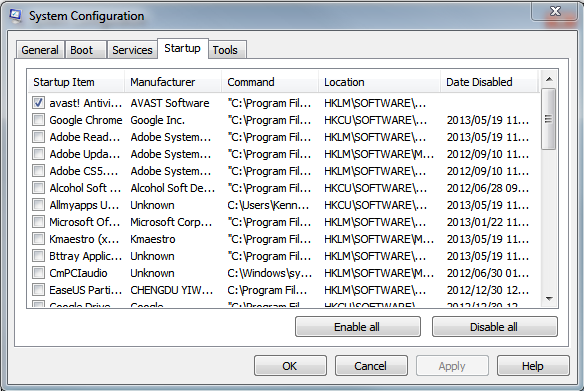 In Windows 8 clicked on the Startup tab select the link Open task Manager here you will see a list of programs however no check box. Under status you can see whether the program is disabled or enabled. to change whether the program starts up or not right click on the program in question and click disable if its enabled or vice versa. In XP, Vista and Windows 7 To prevent a program from starting up with Windows, select the check box next to the desired program after unchecking a program box you will have to select apply and a dialog box will display telling you that you may need to restart your computer for the changes to take affect. Click Restart to restart your computer immediately. If are not ready to restart your computer, click Exit without restart.